Two hundred and nine years after his birth in a log cabin in Kentucky, Abraham Lincoln continues to fascinate. His moral clarity, his extraordinary gifts with language, his decisive role in preserving the Union and what some consider his ultimate martyrdom combine to make Lincoln a mythic figure that still has a firm hold on our collective imagination. It is commonly known that Lincoln had a deep commitment to the rule law and an abhorrence of mob rule. A conservative estimate puts the number of books written about the 16th President at around 16,000. 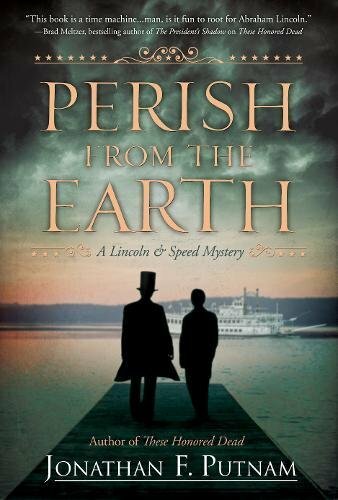 Nationally renowned trial lawyer and avid amateur Lincoln scholar Jonathan F. Putnam adds to this number with his new historical novel Perish from the Earth, the second installment in the Lincoln and Speed mystery series. In this sequel to These Honored Dead (2016), we find Kentucky gentleman Joshua Speed once again teaming up with the future president to help solve a murder aboard a Mississippi riverboat in 1837. Newly minted trail lawyer Abraham Lincoln is riding the circuit, traveling by carriage with other lawyers and a judge to bring justice to the remote parts of Illinois. Meanwhile, Lincoln’s close friend Joshua Speed steams up the Mississippi River aboard a steamboat owned by Speed’s father. Suddenly, his journey is interrupted when a rigged card game turns violent and then to murder. Speed enlists Lincoln to defend the accused, but soon they come to discover that more than just the card games are crooked aboard the Speed family’s ship. As the Day of Judgment hurtles toward them, Lincoln and Speed must fight to save not only the life of Lincoln’s client but also the merit of Speed’s good name. Perish from the Earth is an admirable sequel and meticulously researched. In it we see Lincoln as an eager young trial lawyer, employing his gift of storytelling and turning his failures into successes. While Putnam points out that this is a work of “imaginative fiction,” he also states that “the people, places, and cases populating it are drawn from Lincoln’s actual life and times.” Nearly everything in this novel feels plausible and is in keeping with what is historically known about Lincoln and his times. Although the pace of the plot is a bit sluggish and a little unengaging at times, fans of historical and legal fiction will not be disappointed. Overall, there is plenty of intrigue to delight mystery genre enthusiasts, enough historical accuracy to placate any history buff, and sufficient courtroom drama to satisfy any legal eagle. Michael Thomas Barry is the author of seven nonfiction books that includes Literary Legends of the British Isles and America’s Literary Legends.